It was a superb comeback performance by Rachel Yang who returned from a career ending sporting spine injury to break her old 3.75m pole vault mark with a new height of 3.81m in a recent SAA sanctioned Pole Vault series meet. The series held last 14th August at the Cedar Girls’ Secondary School also saw the petite Rachel qualifying for the upcoming Asian Games in Guangzhou, China. Having picked up a slipped disc injury last year prior competing at the SEA Games, where a MRI scan confirmed that she had two inter-vertebral disc, L4 and L5 protruded, and subsequently bowing out of the SEA Games finals due to the injury, it must be delightful for Rachel to be at the top of her form currently and breaking records. With having shattered her old mark by some 6 centimeters, the former HCJC and Cedarian now sets her sights at the 16th Asian Games (12-27th November). Info via David Yeo, national jumps coach, “I started SAA Pole Vault Series in the year 2007, a year after my return from Adelaide, Australia. The intention behind was to create more competition opportunities for vaulters, especially those budding ones. I felt that beginners need more competitions just as what Mr. Wilson Kipketer, the 800m World Record Holder shared and confirmed in the IAAF RDC Middle Long Distance Seminar last week in Copthorne Orchid Hotel – young athletes should “Train Less, Compete More”. 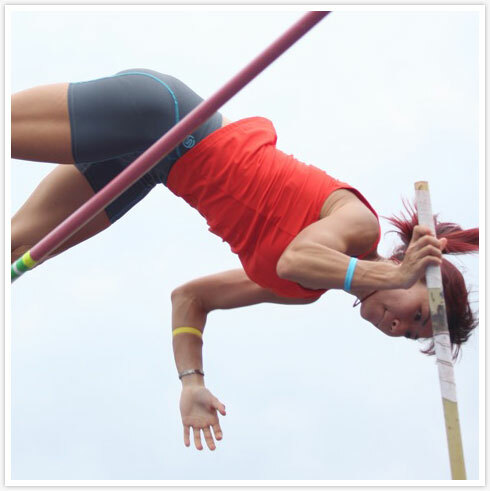 Prior to 2007, the pole vault event featured in all SAA competitions had starting heights of 3.20m and above. As such, many of the young vaulters weren’t able to clear the first height. As beginners, they could only manage 2m plus. Sean Lim (sec 2 in 2007, currently JC year 1) – our current junior record holder who became the first Pole Vaulter in Singapore to qualify for World Youth C’ships in 2009 broke the record of 4.60m by my previous vaulter, Solomon Tan. The former set the record at the age of 16 where the latter did it at the age of 19. Benjamin Ng (sec 3 in 2007, currently preparing for A Levels) – personal best of 4.50m achieved in 2009 which unfortunately was achieved after the World Youth Championships, if not would have qualified him for the championships as well. Chan Sheng Yao (age 14, currently sec 2) – personal best of 3.97m achieved yesterday in the Pole Vault Series 2. What’s worth mentioning here is Sean Lim’s best at 14 year old was only 3.30m.